If you assume that Double Stuf Oreos are doubly stuffed (which may turn out to be false), then using the Nutrition Facts labels, you can write the following system of equations, where x represents the number of calories in one wafer and y represents the number of calories in a single layer of stuf. The first line represents the caloric content of a single serving (three cookies) of Regular Oreos; the second line represents the caloric content of a single serving (two cookies) of Double Stuf Oreos. Getting to this system represents some effort on the part of me and my College Algebra students. They are wont to represent their work arithmetically; my job is to help them to transition this arithmetic problem solving to algebraic generality. It is work that I love, but it is hard work. We had gotten ourselves there, and we had discussed the importance of being very clear about the meanings of our variables when I presented the following graph in class yesterday. The basic questions in front of us were, What does the blue line represent? What does the red line represent? What is the meaning of this graph? We had a number of false starts and hesitations. 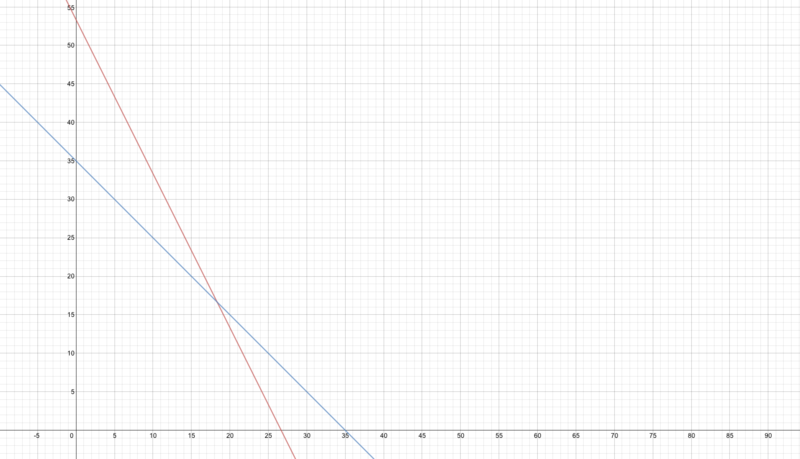 After a few minutes of this, a student pointed our attention to the slope of the red line. Student: The slope is –2. Me: Why is it negative? Student: Because it goes down. Student: Because if you count the squares over and the squares down, and write rise over run, it’s negative 2, which means the line goes down. Me: Right. But what does that have to do with Oreos? A few moments of contemplative silence from 44 college students. Student: There are twice as many wafers as stufs in the regular Oreos, and the red line represents the regular Oreos. Me: Right. But why negative? A few more moments of contemplative silence from the group. This is not a routine they are familiar with, but they are working hard to acculturate themselves to these new expectations. I allow a few moments for this to occur. Me: Raise your hand if you wrote that “x represents wafers”. Student: Isn’t it “number of calories in one wafer”? I’m preaching the good word of Oreos to the people of Minnesota today (9:25 in Harborside 203, if you’re in Duluth this morning). Here is a link to the definitive collection of Oreo-related posts in the blogosphere. If you have others, send them my way and I’ll add them to the collection. A couple of evaluations. A few called for more close ties to a classroom task. I get that, and I think it is reasonable for teachers to use this context and adapt for their own instruction (see reference above to my proposed licensure exam). This came in the mail this week. How timely. @Trianglemancsd @Mathalicious wow, i wish i could get a price that good on bagels out here! Those in which each equation represents partial information about two or more static relationships and we seek to infer information from the system. We will call these unknown value problems. Racing problems are pretty easy to cook up and to make plausible. One person gets a head start, but runs more slowly. There is a greater start up cost for service A, but the unit rate is less than for service B. Et cetera. We make some simplifying assumptions (e.g. that rates are maintained throughout the race), but with a bit of finesse it’s not too challenging to make these seem reasonable, and thus to avoid the dreaded pseudocontext. Boat in the river. Kerry’s motorboat takes 3 hours to make a downstream trip with a 3-mph current. The return trip against the same current takes 5 hours. Find the speed of the boat in still water. From Bittinger, et al., College Algebra: Graphs and Models. Juice blends. The Juice Company offers three kinds of smoothies: Midnight Mango, Tropical Torrent, and Pineapple Power. Each smoothie contains the amounts of juices shown in the table. On a particular day, the Juice Company used 820 ounces of mango juice, 690 ounces of pineapple juice, and 450 ounces of orange juice. How many kinds of smoothies of each kind were sold that day? [Table omitted-you get the point] From Stewart, et al., College Algebra, Concepts and Contexts. Variations involve canoes and known distances instead of known current speeds, or (worst of all) known differences in canoeing speeds, but unknown canoeing speeds. They also include varieties of gasoline sold, together with known totals, but unknown breakdowns. These are all completely phony, and what are we doing measuring boating speeds in miles per hour, anyway? It took many trips through the land of College Algebra before I could put my finger on the difference between racing problems and unknown value problems. Part of the difficulty is that unknown value problems often masquerade as racing problems, as in the Boat in the River problem. When I wrote my Oreo manifesto, I was on the verge of a breakthrough on these matters. And now I offer the results of this breakthrough to you. The key question for me was this: What are some scenarios in which we really do have information about sums of parts, without knowing the values of the parts? I have two such scenarios, each of which breeds many real-world problems. These are the Oreo problems. 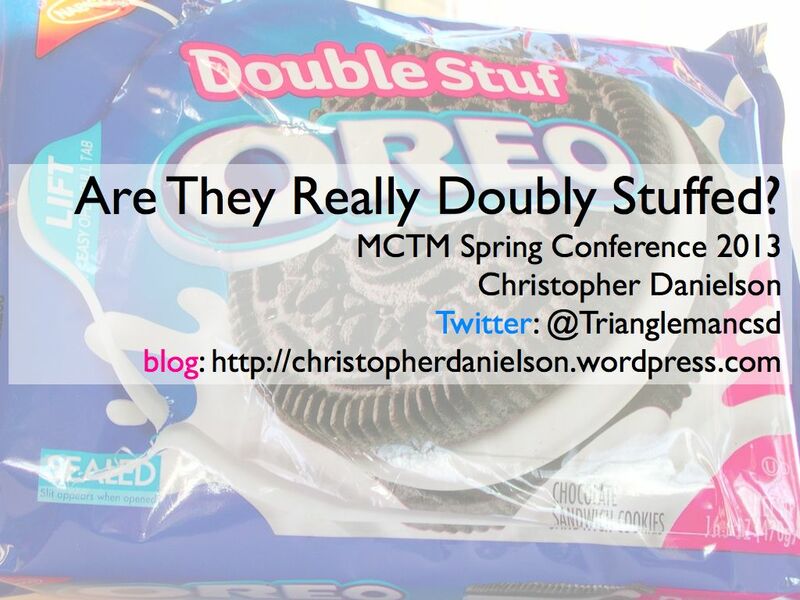 If we accept—as Chris Lusto has demonstrated decisively—that Double Stuf Oreos are in fact doubly stuffed, then we can use nutrition labels to answer questions such as, Are there more calories in the stuf of a regular Oreo, or in a wafer? What about fat? Nutrition labels give us information about the calorie (or fat) content of the whole cookie; we need to infer the calorie (or fat) content of the constituent parts. Having mastered that technique, we can move on to Ritz Crackerfuls. The Big Stuff Crackerful has “75% more stuff” in the middle. Again, data from the nutrition label allows us to use a system of equations to infer the caloric content of the crackers and of the cheesy stuff. Then it’s on to milk. One percent milk has 100 calories per cup. Two percent milk has 120 calories per cup. (These are approximations, of course). So how many calories should be in a cup of skim milk? How many calories should be in a cup of pure milk fat (the answer is surprisingly large)? And what percent is whole milk, anyway, given that it has 150 calories per cup (this one is surprisingly small if you don’t know the answer already)? E85 is 85% ethanol, 15% gasoline and is cheaper than regular gasoline in the Midwest. Regular gasoline, though, has ethanol in it too-typically 10%. We should be able to use a system of equations to compute the underlying prices of pure ethanol and of pure gasoline (again, I get that there are simplifications involved here), and then to predict the price of gasoline with 20% ethanol, which will be required in Minnesota sometime in 2013. A simpler version of this comes from my trip east this past summer. In rural North Carolina, I found a gas station that proudly announced that one of its two pumps dispensed “Ethanol Free” gasoline, while the other warned that its gasoline contained 10% ethanol. The former was more expensive (and does not exist in Minnesota, which is what made the sign remarkable to me). At my local butcher shop, 90% lean ground beef costs $3.89 per pound, while 85% lean ground beef costs $3.69 per pound. What does this say about the underlying per-pound price of beef fat? How about of pure lean beef? It occurred to me for the first time last night that I could apply the pricing techniques to Oreos. That is, I began to wonder whether the Triple-Double Oreo is fairly priced. We should be able to infer the price of a serving of stuf, and the price of a wafer, then calculate the expected cost of a bag of Triple Double Oreos. My experience is that all bags of Oreos are priced the same, regardless of contents. So is it fair? I don’t know. But I’m gonna find out. So there you have it. Two scenarios, each with multiple examples, in which to situate your unknown value systems of equations problems. You no longer have an excuse for assigning the Boat in the River problem. I’ll know if you do. Here is why you should not. A further distinction between racing problems and unknown value problems is that racing problems are usually best modeled with slope-intercept form while unknown value problems are usually best modeled with standard form. Similarly, it seems weird to describe the running of a race in standard form. can describe someone who got a 20 meter head start, and who runs 5 meters per second. But to rewrite this as obscures these facts. Why should the sum of the distance and the opposite of 5 times the elapsed time be constant at 20? 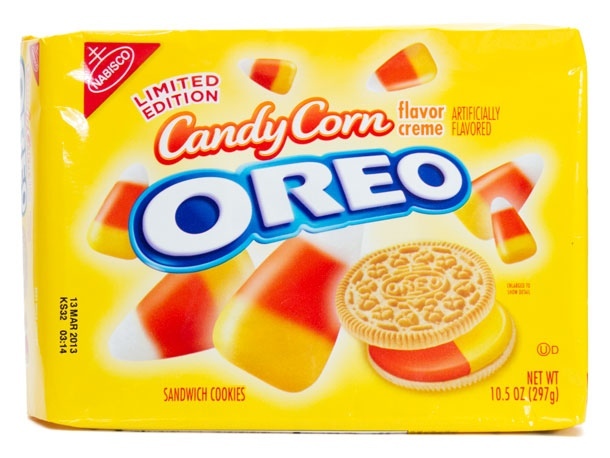 You should know that Candy Corn Oreos exist, and that one serving consists of 2 cookies which collectively weigh 29 grams, contain 150 calories and 7 grams of fat. You should know further that one serving of candy corn consists of 19 pieces which collectively weigh 39 grams, contain 140 calories and 0 grams of fat. Ask my college students and they would likely recognize that aspect of my teaching, although I tone it down a bit for adults. In the past six months, I have found a wealth of examples of amazing storytellers in mathematics. I met Dan Meyer and Karim Ani. Each of them uses the language of acts for describing lessons (although they don’t quite agree with each other on the meaning). And I (along with several hundred thousand others) discovered Vi Hart. Fabulous, smart mathematical storytellers; each and every one. Out of this rich stew of stories comes the following. It’s the first of several I’ve got brewing. Help me make them better, will you? UPDATE: In response to initial feedback in the comments, I revised the original video and posted it above. Two changes: (1) Sloppy audio levels were fixed (this is embarrassingly easy to do in iMovie), and (2) The video ends with the two pricetags sharing screen space-for easy reference. I’m unsure whether the second change is an improvement. See comments below.